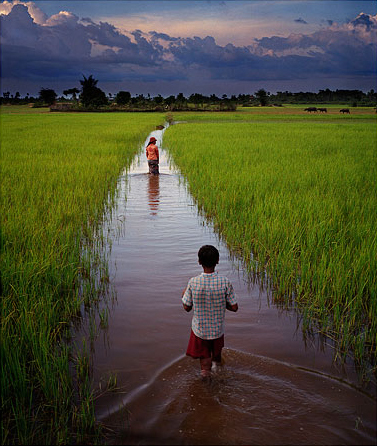 A Cambodian rice field photographed in 2006.
risk being out-competed by foreign merchants. can’t receive more capital from the government or private banks,” said the association’s secretary general Ut Ren. Cambodia has about 100 millers, which purchase paddy from farmers, process the rice and sell it to dealers. If the millers are able to borrow short-term funds, they can purchase more paddy and sell more processed rice. to $70,000 to buy paddy during the harvest season. said its 35 members were clamouring for more capital to purchase paddy. Schemes are underway to increase agricultural loans to millers. capacity for exports, according to its director general Sun Kunthor. Some banks are also increasing their loan portfolio in the field. loans of $78 million made to the sector last year. Cambodia, and also increased orders from overseas,” he said. States and Asia in the next year.